In the history of humankind, tuberculosis (TB) has killed more people than any other disease. TB remains one of the top 10 causes of deaths in the world and competes with HIV/AIDS as the biggest killer amongst all infectious diseases. One of the overarching problems with TB is how difficult it can be to find and properly diagnose the people who are infected with active TB. As a result, approximately 3 million people who are not aware that they have active tuberculosis and are unwittingly infecting, on average, 15 to 20 more people beyond themselves. You can picture the exponential spread of the disease and recognize how frighteningly quickly those numbers add up: 1.4 million people will die from the disease this year, two to three people every minute, nearly 4000 every day. Yet most people know almost nothing of TB and likely think that it is no longer a public health challenge. Today is World TB Day, and this year’s focus is on finding and treating the 3 million people with active TB who are missed by public health systems. 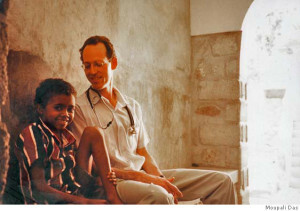 So I invited my friend Dr. Paul Farmer, one of the most innovative, admired, passionate and compassionate people working in public health, to answer a few questions about TB, focusing on how and why he has devoted so much time to this disease, and what he sees as the road ahead in our quest to serve every person who is vulnerable to TB and ensure that high-quality treatment is available to all who need it so that no one dies. Paul, thanks so much for your insights. Let’s start by understanding how you got started working on TB, a common–and in many cases lethal–infectious disease that kills 4,000 people every day, nearly all of them in developing countries. How did you first get involved with TB? I’m grateful that you asked. When I was 23 years old, in between college and medical school, I went to rural Haiti, and as chance would have it I ended up in the town of Mirebalais. While there, I saw an episode that has stuck with me: a young woman coughed up bright red blood. I’d never seen anything like that in my life. She was referred to a clinic elsewhere and I later heard that she’d died. The diagnosis was tuberculosis. That was the first time I’d ever really thought about tuberculosis as a disease of young people, or a disease that could cause someone to cough up one’s lifeblood and die suddenly. In the years that followed, I saw, alas, a lot more cases, usually far less dramatic, but in the first years of my medical training, no less discouraging. Was there something specific about the public health challenge of tuberculosis that captured your interest? Certainly. When I began my studies at Harvard Medical School, I learned that the disease had been declared “cured” for decades, and that there were more than a dozen antibiotics that, when used promptly and in combination, could cure pretty much everyone of tuberculosis. So even before I got involved working with community health workers to treat tuberculosis in a squatter settlement not far from Mirebalais, I learned that it was really a problem of the delivery of services. While the public health challenge was of course preventing transmission, the key was to improve systems that could deliver prompt diagnosis and effective care. I learned the hard way with my colleagues in Haiti that this could not be done with the tools of clinical medicine alone. We needed to develop “delivery platforms” to treat tuberculosis and address the poverty that both puts people at risk for the disease and prevents them from being cured of it. With this airborne disease, good delivery systems prevent transmission–and that’s what public health is supposed to be all about. That’s why we foundedPartners In Health in 1987–to focus on what we call the structural barriers to the diagnosis and cure of tuberculosis and other diseases afflicting the poor. This approach, linking prevention and care, is what later took us to shantytowns in urban Peru and prisons in Siberia, and it is the same strategy needed to address major challenges such as AIDS and malaria. And it works–that’s why we find the notion of global health equity so compelling and different from previous efforts to combat diseases of poverty. The Millennium Development Goals (MDGs) challenge us to achieve universal treatment coverage for tuberculosis by the end of 2015. This would require increasing the number of people being treated for TB by three million, from 6 million today. Do you think it is possible for the world to identify, test and treat those 3 million “missing” TB patients and what impact could this have on curbing the spread of TB? Sure, it is possible. Alas, we are not yet on track to meet this goal. As you know from your work on malaria, Ray, there are some illnesses for which we don’t have a vaccine, but for which we do have great diagnostics and pretty good therapy–HIV disease is the classic example. For others, we have no vaccine but good prevention, good diagnostics, and good therapeutics. Malaria, from bednets to treatment with artemisinin-based combination therapies, is an example. So, with tuberculosis, what are the ranking problems with meeting this MDG? We have no reliable vaccine and decent therapeutics; diagnostics remain a big challenge, as does the threat posed by drug-resistant strains. For example, with the tools we now have, it is very difficult to diagnose tuberculosis in children and in patients with tuberculosis occurring outside of the lungs, as is often the case among people infected with HIV (tuberculosis is far and away the leading killer of patients with HIV). If I were to wish for three things to meet the tuberculosis MDG, I would say: 1) better diagnostics; 2) shorter duration therapies; and 3) more support for community-based care. If we had an army of community health workers and more sensitive diagnostic tests, we could meet the MDG. All of this depends, of course, on adequate financing for implementation of this more ambitious approach. I’ve seen you and others work to marshal the resources necessary to get the job done with malaria. We need more such help to take on tuberculosis. As the fight against TB has increased in strength over the years, so has the disease itself. Strains of TB that resist conventional treatment are on the rise, and not just in developing countries. The “BRICS” countries — Brazil, Russia, India, China and South Africa — account for more than half of all multi-drug resistant TB cases. What are these established and emerging markets doing to curb TB in their own countries? As chance would have it, I’m heading today from Mexico to Russia, which is the country on this list that I know best. And I can tell you that some of the successes in Siberia over the past ten years are worth celebrating and emulating. For example, in the region of Tomsk (an area of Western Siberia about the size of Poland), in 2000, fully a quarter of prisoners on treatment for tuberculosis were dying. This was due largely to multidrug-resistant strains, which required, again, diagnosis and proper therapy. Within one year of addressing weaknesses in laboratory services and supply chains inside the Tomsk prison system, mortality dropped almost to zero, and has remained there. That’s a major victory. Even better, the size of the tuberculosis epidemic there has been halved. So here’s an example of the prison and civilian tuberculosis services working together, along with many partners, to turn the tide in a high-burden region. By the way, this work was funded not only by Russian authorities, but also by The Global Fund to Fight AIDS, Tuberculosis, and Malaria, The Gates Foundation, and Partners In Health. I feel very grateful to have been involved in this work. In China, the prevalence of tuberculosis fell by half between 1990 and 2010. But that doesn’t mean that MDR-TB is going to disappear without a fight: 110,000 new cases of MDR-TB were estimated to have occurred in 2010 alone (along with perhaps 8,200 cases of so-called “extensively drug-resistant” tuberculosis). China clearly has the resources that would be required to turn the tide on MDR-TB there, and so does, I believe, Brazil. As in Tomsk, this requires strong government support for taking on the complexity of these epidemics, including multidrug-resistant tuberculosis. I understand from clinician colleagues in parts of India that it remains very difficult for patients with MDR-TB to access prompt diagnosis and effective care. One of the challenges that TB faces is that it has such a low profile among both policy-makers and the general public. Why do you think that is, and how do you think we could tell the story of TB more successfully to engage critical people. One of the problems is surely the mistaken notion that tuberculosis is no longer a ranking threat to health and wellbeing. I can’t tell you how many people, including policymakers, have said to me, “Oh, I thought that tuberculosis was a disease of the past.” There needs to be more work on the part of health care providers and activists to correct this error. Perhaps one of the ways that we could make this more clear to them and to a broader public is to underline how devastating the problem of tuberculosis in children remains today. Just today, in the British medical journal The Lancet, my colleagues from Harvard and Partners In Health estimate that fully one million children fell ill with tuberculosis (including 32,000 with MDR-TB) in 2010 alone. Their study reveals that not only has the world grotesquely under-estimated the burden of disease in kids, but also that we are failing to detect and treat a vast number of these cases. Again, this is because we don’t have good diagnostics and thereby miss taking proper care of these children, but also miss the chance to stop epidemic transmission in households by using preventive therapy, which requires identifying the children of people with active tuberculosis. I can’t help but believe that if more people knew how big a problem this was among children living in poverty, this would raise the profile of tuberculosis as a public health concern. You’ve been a champion of empowering communities to address local health needs. How can we support local systems so they can adequately absorb existing TB burdens? How do we ensure the financial resources– from donor and domestic sources– are adequate? Most health problems are dealt with first in families, and in a sense, all health care delivery is local: if you feel sick, who do you talk to first? Moving more capacity to prevent, to diagnose, and to care for illness, even serious illness, closer to where people live is empowering–as long as the quality of these efforts is high. So how does this square with my argument for more investment in public health systems? One important link between households and clinics or hospitals is community health workers. There are too few investments from either the donor or domestic sources in training and supporting community health workers, and this is true in the United States as it is in settings where tuberculosis is a major burden. Working on TB and other health issues is challenging, and all too often heartbreaking. How do you maintain the strength to keep going and find happiness in the work you do? These efforts to combat what are indeed heartbreaking health disparities are almost always successful when we have the tools of the trade and the resources–financial and human–to address them. It’s come as a surprise to some people to learn how uplifting this work can be. In the last ten years, we’ve finally had some major investments in the health problems faced by people living in poverty. I can’t imagine anything more satisfying than seeing the results of this “delivery decade“, and I think you know from your work, Ray, these past few years just what I mean. That said, the biggest cause of destitution in the world today is probably catastrophic illness, which is in itself heartbreaking. We’ve got a long way to go in preventing such heartbreaks. What advice would you give to young doctors and public health students who are interested in tuberculosis? Maybe the first advice I’d give them is that there’s a way for everyone to get involved in addressing tuberculosis, and this is certainly true for students receiving training in these areas. This is the case whether you’re interested in basic science research, clinical care, or health policy. Another bit of advice is that we need to keep our aspirations high. A number of my students and former students, drawn to the idea of zero tuberculosis deaths, are taking on neglected aspects of this and other diseases. Many who got involved in this work early are still involved, and find these efforts, heartbreak aside, compelling work to this day. I just spent a week in Chiapas, the southernmost state, and one of the poorest, in Mexico, and what struck me was how enthusiastic many young Mexican physicians-in-training are about confronting health disparities in their own country and around the world. Global health equity is the most rewarding part of medicine and public health–that’s what this is all about.